In an unexpected application of its lane-monitoring vehicle tech, Ford announced that it had integrated the system into a conveyor belt-equipped concept bed that can slide "space invaders" back to their half of the mattress. 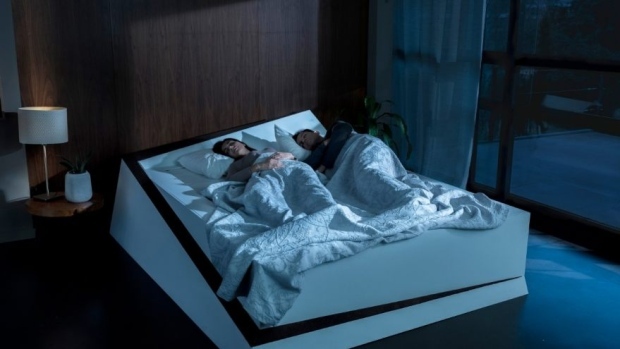 As the second concept unveiled under the Interventions initiative, an initiative to apply "auto-motive know-how to help solve everyday problems," Ford's Lane-Keeping Bed uses the company's automobile Lane-Keeping Aid to ensure that greedy sleepers stay in their lane all night long. When used in cars, the Lane-Keeping Aid "monitors the road markings ahead and actively supports the driver to safely guide the vehicle back into the correct lane by 'nudging' the steering wheel in the correct direction." Likewise, the Lane-Keeping Bed uses sensors -- pressure sensors, in this case -- to identify when someone has moved into their partner's side of the bed and "gently returns them to where they should be with the help of an integrated conveyor belt." This has the potential to be a relationship-saving invention given that each person is able to sleep through the gentle movement of the conveyor belt. However if you're the victim of bed-hogging, the conveyor belt bed does nothing to make sure that you retain your share of the covers. The first concept developed under the Interventions initiative -- a noise-cancelling dog kennel -- was unveiled in last December just in time for New Year's celebratory fireworks. This model used technology similar to that used in headphones and cars including an audio system that emits frequencies that cancels out noises, as well as high-density cork. Like the chicly-constructed Noise-Cancelling Kennel, the modern-styled Lane-Keeping Bed is simply a prototype designed to show the flexibility of Ford's automotive technology, It's not expected to be available for purchase.